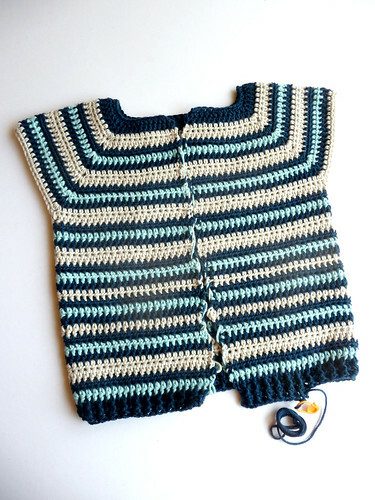 Despite having lots of projects I should be working on–you know, the kind with deadlines?–I was recently inspired to start a sweater for my nephew. If you read the dedication in Little Crochet, you’ll see that the book is dedicated him, he is just an amazingly sweet little guy. I’m going to take next week off to spend time with him and my sis, I can’t wait! I was cleaning out my stash recently and found 9 skeins of Berroco Touche that I bought to make him something (that was over a year ago!). I knew it was time to use them or donate them, so I started the Striped Yoke Cardigan from Little Crochet. You can see that I went rogue with the stripes. I love crocheting stripes, and like to figure out new ways to make different widths and repetitions of stripes without creating any extra ends, but it’s something that can be hard to explain in a pattern. So I kept it simple for the book, but started Tegue’s sweater on Friday night. I had the body done by the end Monday evening. And truth be told, I actually finished it tonight (save for a trip to buy buttons). I made the 4 year old size, since it’s already hot hot summer here in TX, and realistically he won’t wear it for awhile– but I want to see if it fits him well enough that he can wear it to my book signing this Sunday. I think it will look so adorable on him now that he has blue glasses. This project is a fun one, because once you get through the yoke it’s pretty mindless. I enjoy the process of crocheting, and crocheting something I don’t have to think about, or keep track of, reminds me how fun and freeing that can be. It is liberating to just do, and not have to explain. I can’t wait to go pick the perfect buttons tomorrow. After that, I have to stop procraftinating. I play WoW, love watching repeats of Firefly/Serenity (I took a class on this show/movie in college! ), and am helping my fiancee in creating a tabletop role playing game. I usually am working on whatever needlepoint/embroidery project as we play (for some reason, it helps me concentrate). Please help to continue catering to my geekiness. It’s hard finding more and more geek related crafting projects! So adorable! Love that you can adapt your own work to make sense for others but still fun for you to play around with. I do- I weave in at least 6-8" of end and make sure to work the end in in three different directions so it's hard for it to pop out (ie. left to right, then back to the left, then back to the right).